Here's a fun and easy spring thing. These eggs are more of a technique than a specific recipe. 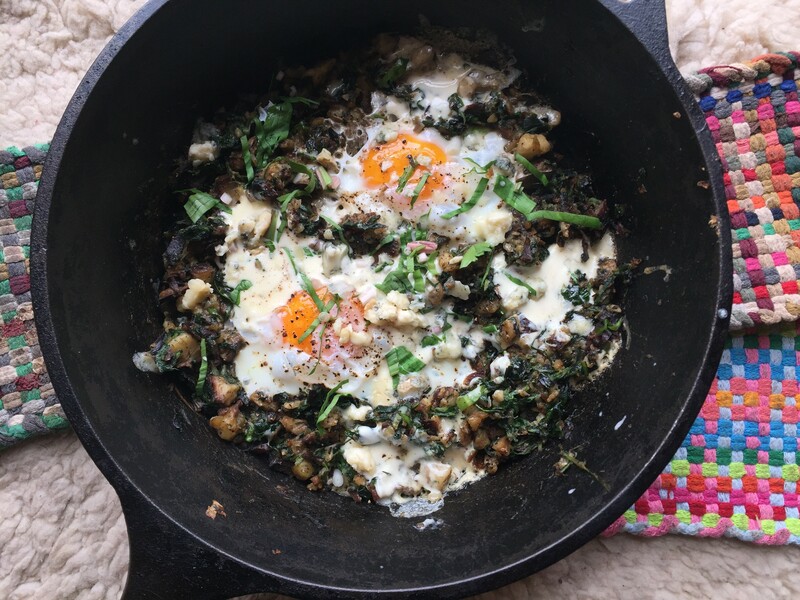 The idea is this: Sauté a bunch of stuff in a skillet — in this case, potatoes, sausage, dandelion greens and wild leeks, but you could use asparagus and bacon instead — then crack a few eggs in there and cook them until they're sunny-side up. Add soft cheese (and blue cheese, too, why not?) for extra fun. The main thing is that everything should be fully cooked before the eggs go in. For something so easy, the end result is impressive to look at and so, so yummy! And about the ramps: Vermont's sustainable food community has been abuzz about the overharvesting of wild leeks and fiddlehead ferns every spring for several years now. Overharvesting is absolutely an issue, particularly in Chittenden County, and largely thanks to commercial foragers who pick every plant in sight, then truck them to Boston and New York City and sell them to restaurants for $15 per pound. While that's bad news, I believe that harvesting a few plants for home use is OK, if you're conscientious about it. Conservationists have all sorts of rules about how and what to pick — leaves only, not bulbs, one leaf from each plant, only one of every seven plants, only immature plants... The list goes on. For me, picking responsibly means taking only what I'll use, and harvesting just a tiny fraction of the leeks from any one area. I harvest so that I cannot discern any visible difference in the plant population or density of the leeks in an area before and after I've picked. I pick from prolific, well-established patches only, and sparsely throughout the patch. Lo and behold, my "spot," where I've picked ramps each year for the past decade, is growing lusher, rather than dwindling. The greens have spread across the old skidder road. Where very few were growing five years ago, they now grow in thick patches and clumps. And they're climbing up the hill. If you buy from roadside foragers or people at the farmers market, ask them about their practices. Have they heard of an overharvesting problem? What do they think about it? Rather than asking a vendor if she "picks responsibly," or about her "ethics," ask how long she's been picking and where she forages. Does she return to the same place every year? Has she noticed a decline in the plant density where she picks, or in the region in general? These questions will help you get a better feel for the forager's relationship with the land, rather than confronting her point blank with a hot-button issue. If someone thinks you're going to judge them if their answers don't meet your expectations, they may not be honest with you. Boil the potatoes in salted water 5-10 minutes, until softened but still firm. Meanwhile, split the sausage and brown in a skillet over medium heat, breaking into little pieces. If there's a lot of grease, drain. When the potatoes are finished, remove them from the water with a slotted spoon and add them to the sausage skillet. Place the dandelion greens in the potato water and boil 2 minutes, then plunge into ice water. Drain and chop, then add along with the leeks to the sausage and potatoes. Cook 3-5 minutes, stirring often, until the greens start to crisp up here and there. Make little wells in the potato mixture for each egg. Crack eggs into the wells, then use a fork or toothpick to break the whites. They'll seep into the cracks in the hash and cook faster (and completely) so you can still get firm, set whites and a nice soft, runny yolk. Add dollops of soft cheese here and there. Cook another 5 minutes or so, until the egg whites are cooked and the yolks reach your desired consistency. Personally, I'm all in for the runny yolk, but this particular recipe works fine with firmer yolks, as the cheese adds just enough gooey moisture to satisfy. Scatter with blue cheese and fresh-cracked pepper, and serve right away!